Stephen Mansfield begins the book with a dazzling overview through the history of beer, and it does great justice to highlighting what lead to the stringent prohibition that extends into the mindset of so many Christians even today. The mindset came after years of beer seen not only as acceptable but beneficial. With the first chapter precursor out the way, Mansfield dives into the history of the Guinness brand we all recognize beginning with Arthur Guinness 250 years ago. Revealed in these pages is a family line of brilliant brewers who continually changed the way things were always done. Through countless challenges, the brand would endure with more than, but still including a drive for excellence, innovation, expansion, and mastery. More important than all these is the silver thread weaving its way throughout. Deep in the heart of its original founder, Arthur, is a heart for their God which would kindle each generation to follow. Mansfield reveals lines of Guinnesses you likely have never seen who were renowned men of faith. This foundational faith of the Guinness family line necessarily created stories of benevolence, compassion, and social justice, which would be groundbreaking even today. You will find stories of revitalization of whole cities and countries brought about by the Guinness brand and family because they could not avoid the call of their God on their lives. Mansfield is an able historian, and if you are like me the history will weigh on your attention from time to time. If you have a love for beer or God, you may have to challenge yourself to endure through your own judgments. 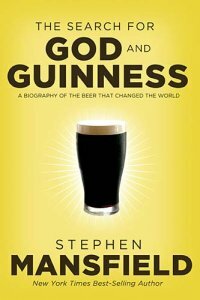 But if you have a love for both God and beer, this book will leave you craving a world changing conversation with friends over a pint of the saintly stout.